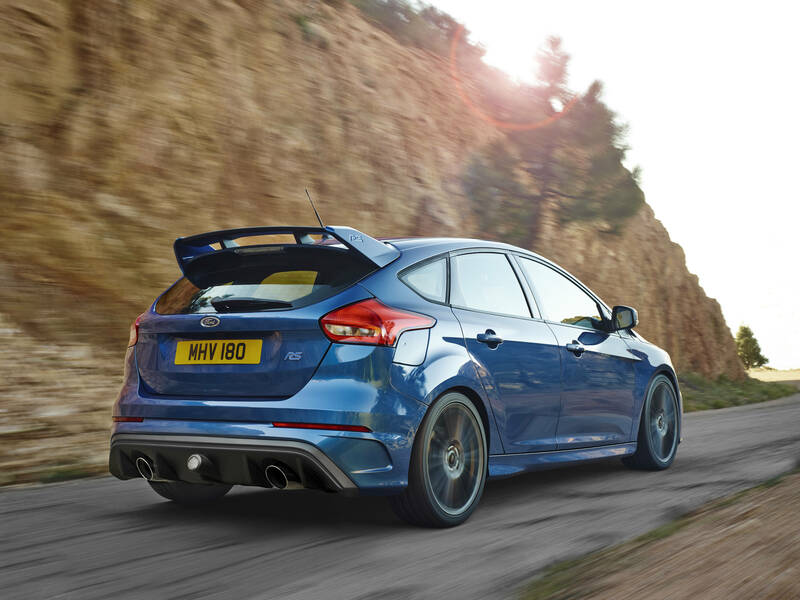 Here comes the new Focus RS – the yobbed-up, full-bore version of Ford’s trusty hatch – and, just like that, sliding a car on purpose will never be the same again. Yes, two years of painstaking research and development and a consultation process that took on board the desires of Ken Block, US rally driver and self-labelled “Hoonigan” – the name of his racing team – have led us to this: a Drift mode. You too can be the Hoonigan you always knew yourself to be, the simple button by the handbrake seems to be saying, and maybe not end up in a hedge on your roof in the process. Here, truly, is a groundbreaking moment in the history of going sideways, and understandably the need to mark it took me swiftly to Valencia, in Spain, and into a tarmac clearing, at the centre of which stood that mystic feature of the land that has beckoned Hoonigans since the dawn of time – a ring of cones. The idea was to set the Focus RS gently circling within the cones at about 15mph and then, when the tyres were least expecting it, stuff the accelerator into the floor. At which point the car would start twirling like Darcey Bussell, but with a bigger engine, while the tyres screamed and the resulting smoke formed a low seam of acrid fog above the area, as after a battle re-enactment. Accordingly, my attempts to out-Block Ken Block largely caused the car to turn no more viciously than a carousel at a steam fair. Woo and, indeed, hoo. You would say this much for my way of doing it, though: it spared the tyres, and someone has got to have a conscience about these things. In any case, I hazard that the majority of Focus RS owners won’t have the access to a Michelin supply truck that makes going sideways on a frequent basis possible, and will probably be at least equally interested in going forwards and, when necessary, backwards. Accordingly, it’s a pleasure to report that the Ford Performance team’s all-wheel-drive system with torque vectoring also yields tangible benefits in the conventional directions, cunningly combining, in tandem with the car’s manual gearbox, the reassuring road clasp of a four-wheel-drive system and the whippy, sporty attitude of a two-wheel-drive setup. In the Sport setting (and in Track mode) the four-cylinder 2.3-litre engine played an enlivening fugue of pops and bangs on the exhaust. The suspension was compliant and even potentially civilised. The car will cling tightly to bends and catapult you past unwanted obstructions – and do both these things while obligingly declining to shake your bones apart. The plan seems to be for the Focus RS to be part of a rorty wake-up call for the entire Ford brand, around which familiarity has bred, if not contempt, a kind of fuzzy indifference. Clearly stung into action by frayed old gags about Mondeo Man, the company has given its new ad campaign the theme of discarding your preconceptions. How wrong have our preconceptions been about Ford? No doubt we’ll all fall to confronting that question in our own ways in the coming months. This car is without question a massive step sideways for Ford. And, in the world of the Hoonigan, that’s progress. Horrible review! Only talks about drifting, gives performance 4 stars but barely mentions the road drive other than poor mpg! Frozen Mike and RocketRS like this. That is the most sissified self-indulgent car review I've ever read. Pure drivel. It's much more entertaining though when you read it out loud with an smarmy British accent. MidCow3, j0shm1lls, Pasta Fazool and 4 others like this. Exactly, this car is made for enthusiasts, not for seemingly smarmy elitists. Each to their own. Still, 4/5 is still a great score considering the weird overall write up. I feel that some of the British reviewers have been much harder on the car. Australians have been happier about it, but upset it's going to take so long to get theirs. I'm interested to see what the US journalists have to say. The author admits that other people doing the "circling-within-the-cones" test were successful, while he wasn't. I'd go by the reviews the other drivers wrote.